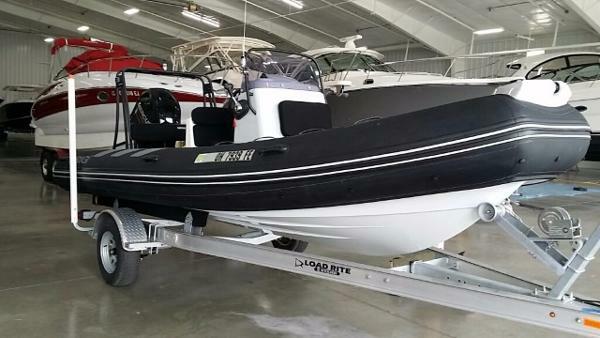 2012 Brig Inflatables Eagle 380 Recent trade in, sold new by us. 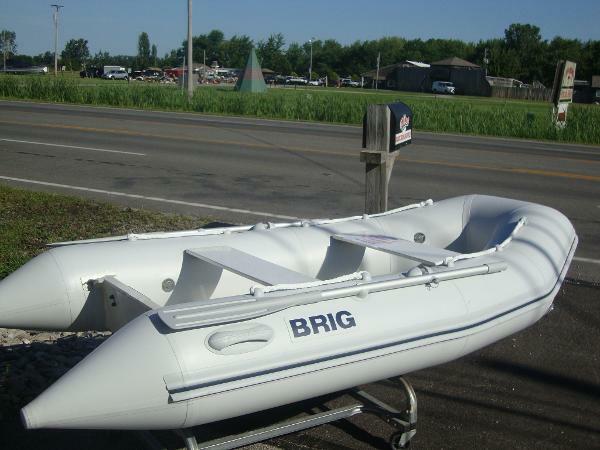 The owner purchased his third Brig, a larger size, This Brig Eagle 380H is the top of the line for Brig Inflatables and is in near new condition! Power is Mercury' 4 cylinder 50 elpt EFI 4 stroke and will move it to the mid 40's top speed. Loaded with extras such as a custom cover, bimini top, sundeck cushions, stainless steel propeller, underwater lights, digital sonar, SeaDek custom it "Orka" hypalon fabric and much more. 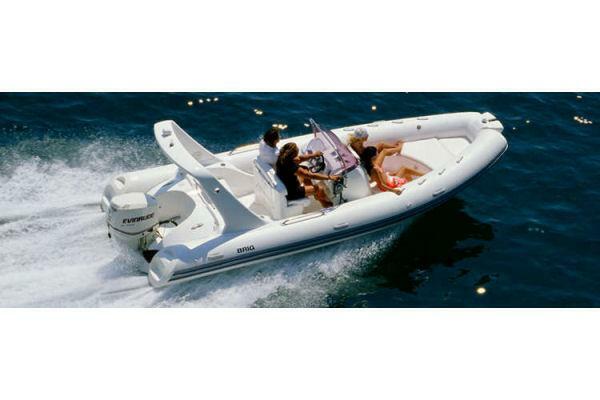 The EAGLE falls into the category of ''luxury rigid-bottom inflatable boats for cruising skiing or tubing''. These models are designed with a deep V bottom and a distinctive stern shape to insure them their highest seaworthiness and stability offshore and in high seas. We have also given them wider tubes made from reinforced Hypalon fabric to guarantee their highest reliability and durability. The E380H, at 3.8 meters in length, is a full member of EAGLE series and the perfect deluxe tenders. They are equipped with an elegant steering consoles, roomy storage lockers, a built-in fuel tanks, and streamlined fiberglass tube ends for quick "up on plane" response. Call for a personal showing and take advantage of finding one of these Eagles previously owned. 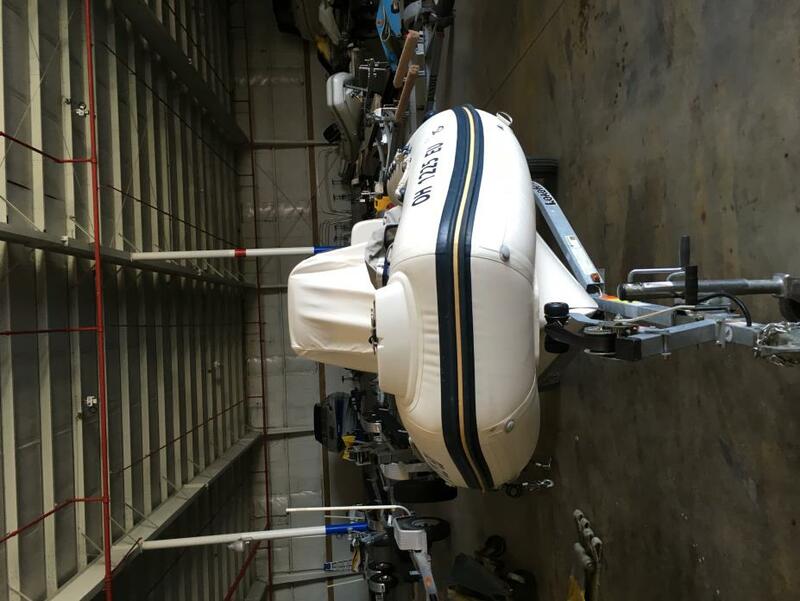 2011 Brig Inflatables Falcon 450 L Previously owned 2011 Brig Falcon 450L 14'7" inflatable RIB, hard bottom, fiberglass hulled boat. 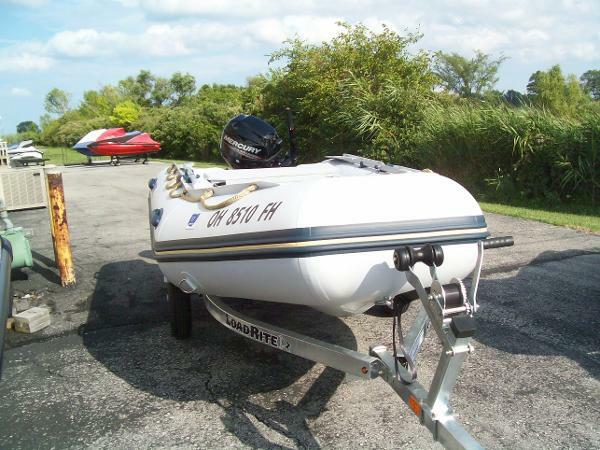 Powered by a good running 1991 Mercury 40 ELPT 2 stroke oil injected power trim, outboard motor. Has a new console, seating, controls, 4 blade prop and a new Load-Rite galvanized trailer. New bimini top Top speed about 30mph, 5-6 passengers, will pull a tube and skier. Our FALCON Riders have been entirely redesigned and reinforced. With the FALCON's foundation of excellence in reliability, comfort, elegance and performance, the new models will make your sea journey an experience you will never forget. Some of our improvements include an even stronger fiberglass hull, increased storage capacity in the bow locker, a greater tube diameter and new stern cones. Add to this our extended selection of auxiliary equipment, and you now have the very boat you've been dreaming of. The anti-skid surface, water settler and transom drain valve, another drain valve for water removal from the hull's interior, built-in bow locker of increased capacity, towing ring and 4 suspension brackets embedded into the rigid hull, wide reinforced rubbing strake, special lifeline along both sides, split paddles inside special stockers on the tubes... all this constitutes the list - far from being complete - of the base design characteristics in this series. Consoles and containers of the boats of SPORT and DELUXE versions are easily and securely installed on special fittings and their inner space may be used to store equipment and rigging. FALCON Riders can be accessorized with overall cover, bow stowage bag, lifting slings and sun top. 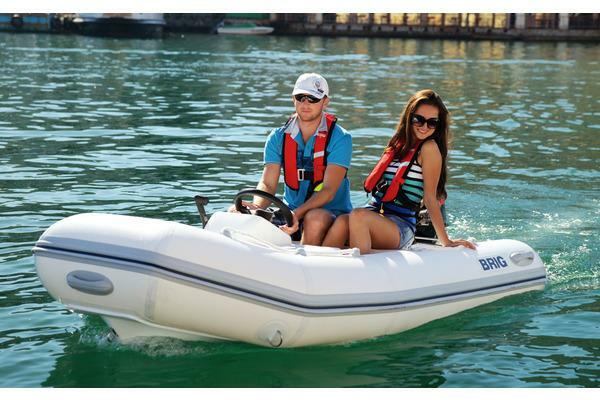 2016 Brig Inflatables Falcon 330L FALCON Tenders are a series of boats equipped with a solid rigid hull (bottom) for use as tenders aboard powerboats and yachts, as well as for recreation. The strong fiberglass hull in combination with inflatable buoyancy tubes gives these boats a smooth, dry ride, high reliability and safety in navigation. Always ready for the journey, delighting the eye with its well-designed hull, a FALCON Tender deserves a prominent place in your travel plans. The special anti-skid surface and specially designed deck profile in combination with water settler and transom drain valve ensure absence of water on the boat deck and allow to walk freely inside the FALCON Tender boat without fear of slipping. 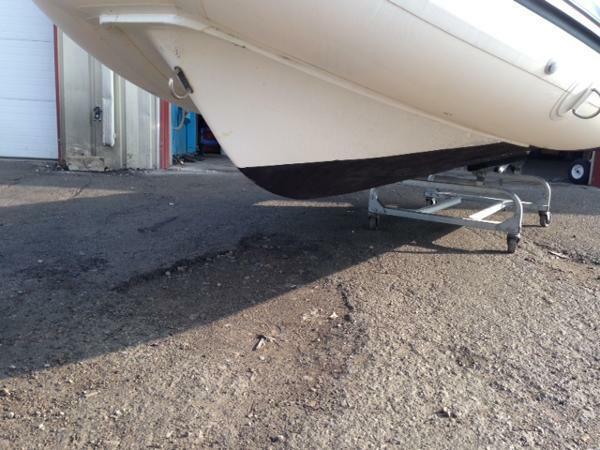 An inner drain valve allows quick drainage of the water between the hull and deck space. 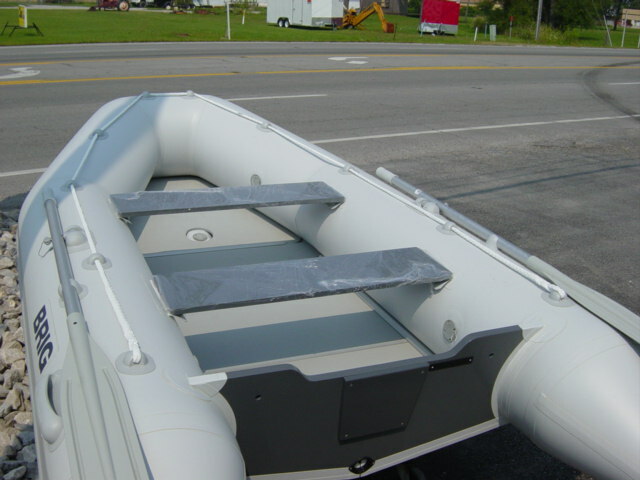 A towing ring and 4 suspension brackets embedded into the hull provide an additional advantage when towing or placing the boat aboard a ship. Models F330 and F360 comes equipped with built-in bow locker. An all around lifeline to serve as support for passengers as well as for carrying the boat by hand. Mountable rigid seats for both passengers and a person at the wheel are provided for most models. Solid cast grab handles for comfortable and safe motoring. 2016 Brig Baltic 310 wide body 2012 BRIG Baltic 310 wide body, 10'4" long & 5'5" wide are the dimensions of the Baltic 310 by BRIG. 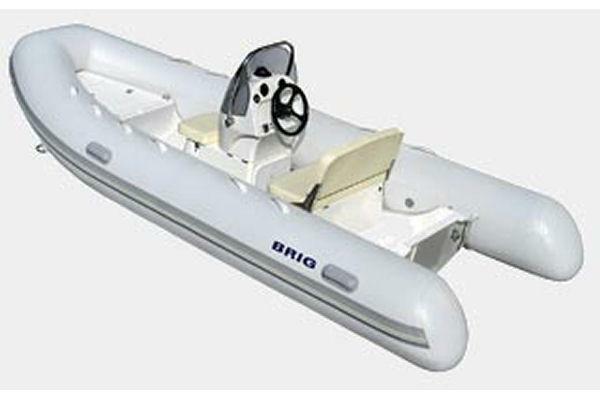 We are the largest dealer for "BRIG" inflatable boats. Pictured is our most popular foldable model that knocks down in minutes and fits in its storage bags. Compare the Baltic 310 by Brig with other brands and you will find this one wider, deeper, with more seating than other quality inflatables. This model comes with a foot pump, oars, repair kit, 2 storage bags,two removable seats, and six years of warranty. 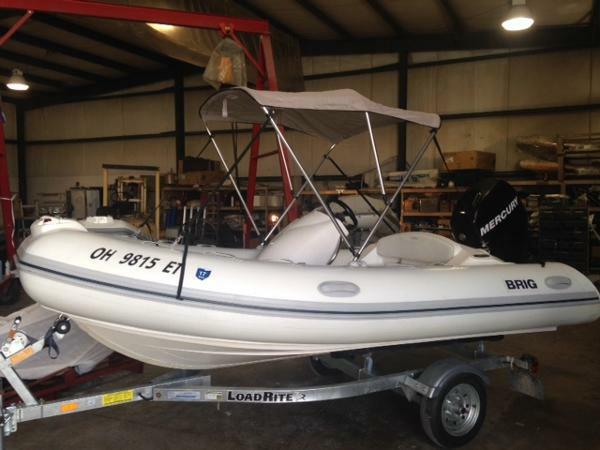 2016 Brig FALCON 330 RIB 2015 BRIG FALCON 330 RIB, 10'10" We are the Ohio and Mid-west distributor for Brig inflatables. 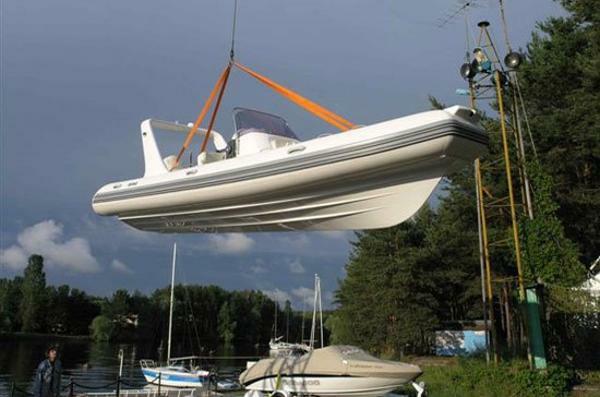 All new Brig inflatables come with a 6 year limited warrenty The Falcon 330 offers a wider beam giving it quicker planing. 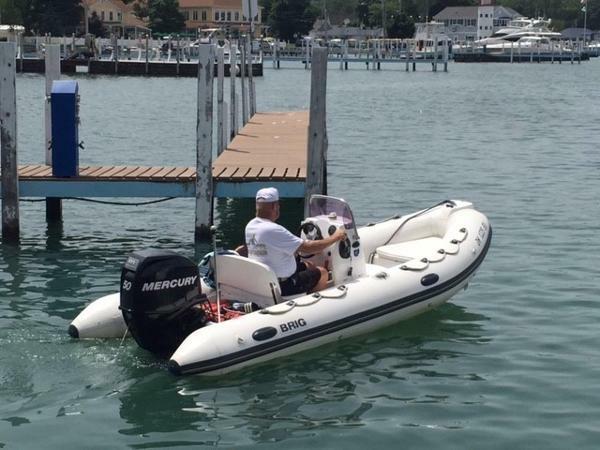 2016 Brig FALCON 300 RIB 2014 BRIG FALCON 300 RIB, Brig 9'10'' R.I.B. with a deep Vee hull design , 5 layer fabric , two seats ,3 air chambers ,deep V hull design and a 6 year warranty . Brig's quality and performance leads the industry.